Runo Lagomarsino utilizes poetic imagery and irony in his practice to reflect on the deeply rooted Eurocentrism that still exists today. His recent work explicitly confronts the history of imperialism beginning with Columbus, documenting its origins in European lust for gold and showing the resulting exploitation. Lagomarsino’s powerful work illustrates the raw violence that remains beneath the surface of the ocean. The artist takes pains to show how the ocean has historically functioned as a threshold promising new possibilities for immigrants, but that today, it is often an impenetrable barrier confronting exhausted refugees. 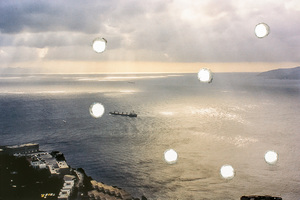 (1st)Photo by Andreas Meck and Terje Östling, provided by Kukje Gallery, Seoul. Courtesy of the artist, Kukje Gallery, Seoul and Nils Stærk, Copenhagen. (2nd) Installation view of WEST IS EVERYWHERE YOU LOOK, 2016, Francesca Minini, Milan. Courtesy of the artist.